Just like being somewhere... only more fun! Big City Station (turn-of-the-century) New! Big City Station (transition era) New! Big City Station (modern) New! Small Town Station (turn of the last century) New! Small Town Station (early 1900's) New! Small Town Station (late 1900's) New! All Scale Magic Sound is scratch built! Built up from a bed of glorious digital silence, and into a three dimensional scale model scene image. Every Scale Magic soundtrack is designed to work in a miniature scene... right from the beginning. 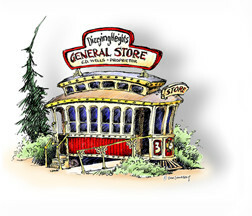 We do not sell collections of recordings of real places. We don't sell full scale recordings. We DO sell dedicated scale sound models! Each CD scene is hand made, meticulously scratch built from hundreds of individual sounds. Each little sound is tweaked mercilessly in the digital audio workstation until it literally 'leaps out' at scale volume levels, but the real magic is in the proprietary Scale Magic imaging we scratch build 'around' every single one of our Scale Magic scenes! The tiny reflections around it are what make a prototype sound appear real, but 'tiny reflections' can disappear below the threshold of human hearing at quieter, scale volume levels. To compensate sound for scale playback, we scratch build and then caricature a dedicated 'ambient scene image' around all of the little sounds in that scene. That's the magic part of Scale Magic sound, and what makes our soundtracks... scale models! We bring hundreds of individual sounds into each scene soundtrack, for the first time... but they have never been a 'place' before. They need to sound like they belong together in the same scene, so we scratch build a final caricatured overall image around every built up scene. This final caricature gives the scene a life of its own, its own sense of place, and an uncanny ability to 'couple up' to full scale ears at scale volume. This really works! And it is engineered to work best at tiny, scale volume levels... and in your model railroad layout! Sound like BS (blowing steam)? You may also read the manual separately. Learn exactly how Scale Magic Sound's proprietary scale imaging works, and how easy and bullet-proof it is to use... before you buy. A great deal of the information in the manual is valuable in any layout sound application, whether or not you buy a soundtrack from us. Download the Scale Magic Scale sound Owner's Manual in .pdf form, and get started dreaming immediately! 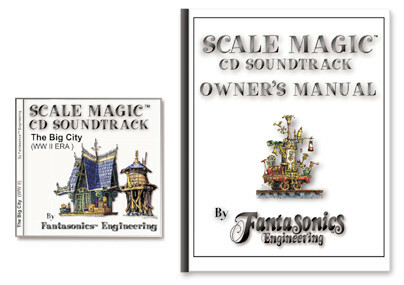 You can use your credit card to buy Scale Magic CD Soundtracks using PayPal! copyright © 1995-2018, Fantasonics Engineering, all rights reserved.